The theatrum mundi metaphor was well-known in the Golden Age, and was often employed, notably by Calderón in his religious theatre. However, little account has been given of the everyday exploitation of the idea of the world as stage in the mainstream drama of the Golden Age. 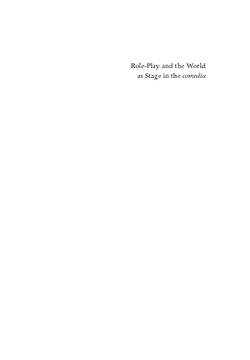 This study examines how and why playwrights of the period time and again created characters who dramatise themselves, who re-invent themselves by performing new roles and inventing new plots within the larger frame of the play. The prevalence of metatheatrical techniques among Golden Age dramatists, including Lope de Vega, Tirso de Molina, Calderón de la Barca and Guillén de Castro, reveals a fascination with role-playing and its implications. Thacker argues that in comedy, these playwrights saw role-playing as a means by which they could comment on and criticise the society in which they lived, and he reveals a drama far less supportive of the social status quo in Golden Age Spain than has been traditionally thought to be the case.